Soundgarden Biography, Discography, Music News on 100 XR - The Net's #1 Rock Station!!! This Grunge Alternative-Metal band formed in 1984 in Seattle, Washington USA by lead singer Chris Cornell, guitarist Kim Thayil, bassist Hiro Yamamoto and drummer Matt Cameron. One of the first outfits to release music on the venerated Sub Pop label, Soundgarden redefined Rock music for a whole generation and had a revolutionary impact on the course of musical history. In the summer of 1987, the quartet released the first single, "Hunted Down", that was soon followed by the 6-track EP "Screaming Life". In 1988 they put out one more EP titled "Fopp" in advance of the band's debut full-length album, "Ultramega OK". Signing to a major label, A&M Records, Soundgarden took a step toward the mainstream with its second album, "Louder Than Love". Released in September 1989, the CD broke into The Billboard 200 at #108. Shortly after the album's release however, Yamamoto left and was first replaced by ex-Nirvana member Jason Everman and then permanently by Ben Shepherd. The year 1991 saw, Cornell and Cameron collaborated with members of Pearl Jam in Temple Of The Dog, a tribute to Mother Love Bone lead singer, Andrew Wood, who overdosed in 1990 and Soundgarden's third album, "Badmotorfinger", climbed The Billboard Top 200 list peaking at #39 spawning a series of alt-Rock radio-ready hit singles: "Jesus Christ Pose", "Outshined" and "Rusty Cage". During the following few years the group toured extensively and supported Guns 'N Roses in the States. 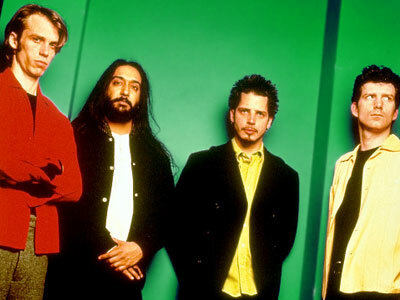 Their next offering was the breakthrough album, "Superunknown", that defined the remainder of their career; it rose to the top spot in U.S. upon its release in March 1994 and was later certified as quintuple platinum by RIAA. 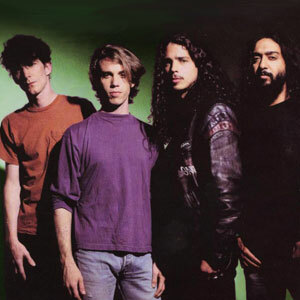 It spoon off three Mainstream Rock top 5 smashes, including the #1 "Black Hole Sun", "Fell On Black Days" and "Spoonman" plus two more top 20 entrant, "My Wave" and "The Day I Tried To Live"; all the five cuts also stormed The Modern Rock Tracks and finally Soundgarden took home two Grammy Awards: "Black Hole Sun" won for Best Hard Rock Performance and "Spoonman" for Best Metal Performance. "Superunknown" was also hugely successful in Canada, Europe and Australia taking them to worldwide stardom. The band's fifth albun, 1996's "Down On The Upside", crested at #2 on The Billboard 200 highlighted by two #1s Active Rock hit singles: "Blow Up The Outside World" and "Burden In My Hand"; another single, "Pretty Noose" went to #4 on The Mainstream Rock list and "Rhinosaur" reached the #19 spot on the same chart. On April 9, 1997, the members of Soundgarden stunned the music world by announcing that they were disbanding. Cameron replaced Jack Irons behind the Pearl Jam's drum kit and Chris Cornell embarked on a solo career. "A-Sides", a retrospective collection, was issued in November of 1997, the CD contained "Bleed Together", a previously unreleased track, which peaked at #13 on The Mainstream Rock chart. In September 2010 Soundgarden released their first collection of music since 1997 in the form of "Telephantasm" a multi-label, career-spanning compilation album which included beloved band hits, deep back catalogue cuts and a previously unreleased track entitled "Black Rain", taken from the "Badmotorfinger" recording sessions, which brought them back into the top 10 of The Active Rock chart. The '90s Grunge gods finally returned and after 15 long years, in April 2012, they released their first new studio song since they broke up; taken from "Avengers Assemble" soundtrack, "Live To Rise", furiously penetrated the U.S. Rock charts peaking at #1 on the Mainstream side and at #12 on the Alternative Songs list. 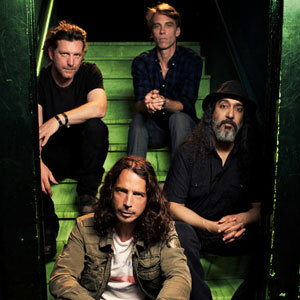 In November 2012 Soundgarden released the band's sixth studio "King Animal", it was recorded at Studio X in Seattle. The disc includes the Rock radio hit single "Been Away Too Long".